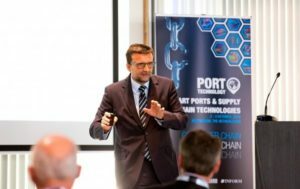 Last week, the Port Authority of Valencia (Valenciaport) presented its Smart Port strategy at the “Smart Ports & Supply Chain Technologies” conference in Rotterdam. The event was organized by Port Technology (PTI) on 2-3 October and addressed such key topics as digitization of ports; intelligent supply chain; data exchange and integration; collaboration and standardization. According to the port’s press service, Valenciaport introduced the concept of a smart port as a provider of services based on Big Data and blockchain technologies and shared its vision on how these could be implemented. De la Guia explains that working with Big Data and the Blockchain technologies in the cloudprovides significant advantages when compared to the use of own servers, as at present. The conference speakers included representatives of the ports of Rotterdam, Amsterdam, Antwerp, Valencia, Algeciras, Barcelona (Hutchison Ports BEST), of such companies as Boston Consulting Group, Royal Haskoning, TBA Group, NAVIS, Kalmar, CargoX, XVELA, as well as UNCTAD and World Economic Forum. Pingback: Maqta Gateway launches pilot test of a blockchain based trade system.